A couple manages their finances on the kitchen table. Feeding a family on a tight budget is difficult, but it isn't impossible. Much of your local grocery store fare -- the processed, prepackaged foods -- may have an appealing price tag but actually offers mostly empty calories and very little nutritional value. With some careful planning and a change of your shopping habits, you can feed your family of six healthy, delicious and satisfying meals on a budget of as little as $35 per week. Go to the grocery store with a list, weekly meal plan, and only the money you have set aside for your budget. Don't charge groceries to credit cards; you will be tempted to spend more and pay for it later. Buy what you need and avoid unnecessary snack items. Plan to cook a large meal on a weekend and reheat leftovers through the week. Stretch a meal that averages $5 a person across the week without adding to your $30 investment. Buy meat in bulk directly from a local farmer. A half cow, butchered into different cuts, will provide enough meat to last a family of six a full year. Freezing the meat will preserve it for months and reduce your monthly meat costs to about $70, or $17.50 per week for all six of you. This leaves half your $35 budget to fill the rest of your plate. Grow your own vegetables. Setting up a small garden in your backyard takes work, but it will impact your grocery bill. If you don't have a backyard, look for community gardens in your area where you can plant small tracts of crops and share produce with others involved in the garden. Grow herbs and spices in small pots in your home to add extra flavor to your meals without stretching your budget. Once your garden is up, running and producing, it can yield up to $600 worth of vegetables annually. That works out to $11.50 per week you will no longer have to spend at the grocery store. Pay attention to coupons and sales. When you must go to the grocery store, be sure to browse flyers for coupons and buy what's on sale. Grocery stores often have "loss leader" deals: a handful of items at an incredibly low price designed to draw customers into the store, where they spend more on other, regular priced items. When the loss leader items are staples of your diet, such as a package of chicken, ground beef or ground turkey for a dollar or two, you can walk out with a few weeks' supply for your family of six for under $10. Freeze what you will not use that week and don't be afraid to cook extra to eat as leftovers to stretch your budget. Cook your own meals from scratch. This is the hardest step for busy, working people, but it will pay off dramatically. 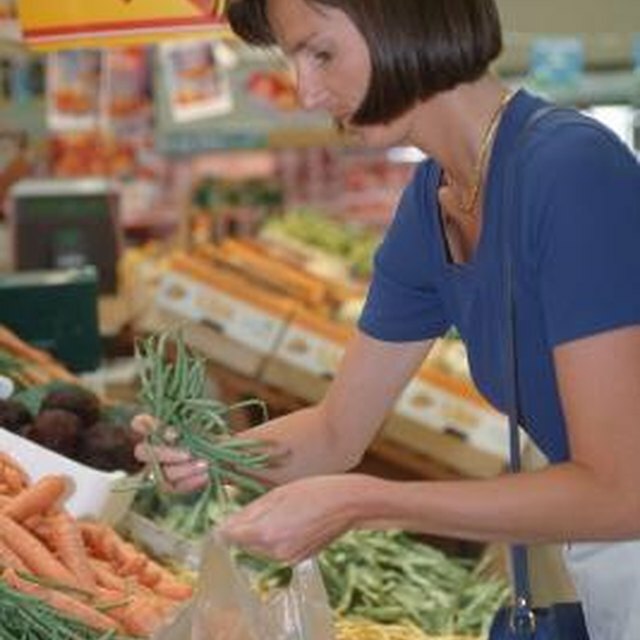 Buying bulk ingredients and cooking your own meals is cheaper than picking up frozen or processed meals. Planning your menu in advance makes this step easier. You know exactly what to make and don't have to think about it when it's time to get in the kitchen and cook. By cooking your own meals from locally-grown ingredients and meat purchased in bulk, you can reduce your family's budget to about $1 or less per meal per person and work to reduce your weekly food budget to $35 for your entire family of six. Jennifer Reynolds is a professional writer covering crafting, electronics and entertainment topics. She graduated in 2010 with a Bachelor of Arts in professional writing from York University.